But before we get into this week's assignment let's get a winner from last weeks assignment!! So here we are at January 21st and this weeks assignment is your Goose in the Corner Blocks and your Half Square Triangle Blocks. Once again, my fabric is still having issues arriving at my house. It finally got tracked down on it's way back to Julie and so now it is on it's way to my house for a second attempt and hopefully I will be updating these pictures very soon. 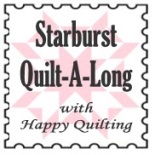 In the mean time, we will be using pictures that I can conveniently borrow from the Starburst Tutorial. Start by gathering those piles you have marked as GC (Goose in the Corner) You should have 16 large squares cut from your background fabric (either 6 1/2". 8 1/2", or 10 1/2") , and 16 smaller squares , 4 each from 4 different print fabrics, (either 3 1/2", 4 1/2", or 5 1/2"). Put the background squares in one pile and the print squares in another pile. NOTE ** To save time, repeat each of the following sub-steps in an assembly line fashion making all 16 blocks at once verses one at a time. On the wrong side of the print fabric, using your ruler, draw a pen line diagonally from the top left corner to the bottom right corner. It is important that these lines are drawn accurately as they will be your sewing guide. Lay your print square on your background square (in any corner) with rights sides together. Pin both sides adjacent to that drawn line. Make sure to put the pins far enough from the drawn line that your presser foot won't hit them as you sew :) Stitch a seam directly ON TOP of your drawn line from upper right hand corner to lower left corner. Remember, chain stitch to save time. Press the seam towards the print fabric. And now you have cute Goose in the Corner blocks. Quick and easy!! You should have 16 Goose in the Corner blocks, 4 of each of your 4 fabrics :) You can set these aside grouped by similar fabrics. Start by gathering those piles you have marked as HST (Halt Square Traingle) You should have 32 squares cut from your background fabric (either 4", 5", or 6") , and 32 squares , 8 each from 4 different print fabrics, (either 4", 5", or 6"). Put the background squares in one pile and the print squares in another pile. ** Once again,To save time, repeat each of the following sub-steps in an assembly line fashion. On the wrong side of the print fabric square, using your ruler, draw a pen line diagonally from the top left corner to the bottom right corner. Lay your print square on your background square with rights sides together. Pin both sides adjacent to that drawn line, and once again, be sure to place them far enough out to leave room for your presser foot to stitch on by. Stitch a seam 1/4" from EITHER side of the drawn line (the black lines represent your stitching lines :) The easiest way to assembly line stitch is to chain stitch the 1/4" seam on the right hand side of the line first for all 32 pinned square sets. Then clip the threads between the squares. Then go ahead stitch the 1/4" seam on the left hand side of all 32 pinned sets. Now you can clip the remaining threads between the squares. Next, align your ruler along the drawn center line. Cut your pieces apart along that drawn line, creating the 1/4" seam on both sets of triangles. Now press all of the squares towards the print fabric. And now you are ready to trim up your HST. You will trim to 3 1/2 for the 24" block, 4 1/2" for the 32" block and 5 1/2" for the 40" block. This example uses the 3 1/2" square. Start by aligning the 45 degree line on your square ruler with the seam line on your half square triangle. Make sure that the raw edges of the half square triangle are over the 3 1/2" line's on your ruler. Trim the 2 sides along the edge of the ruler. There won't be a whole lot to trim. Now spin your block 180 degrees. Once again, align the 45 degree line on your ruler with the seam line on your half square triangle. Align the raw edges of the half square triangle under the ruler on the 3 1/2" lines on your ruler. Trim the 2 sides along the edge of the ruler. And now you have Perfect Half Square Triangles. They take a bit of time to trim but are totally worth it!! Having perfect HST's allows for perfect points down the road. You should have 64 Half Square Triangles total. 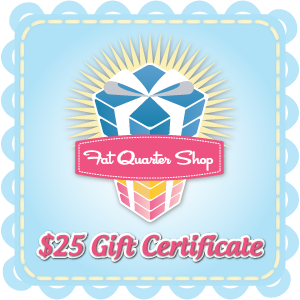 This weeks prize is a $25.00 Gift Certificate to Fat Quarter Shop to get whatever you want!!! It's time to get sewing!! I am so excited!!! 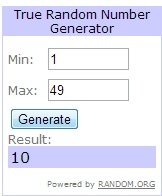 Congrats to the winner and thanks for the tutorial!! Congratulations, Pam! I just received a new sewing machine--it has a laser guide on it--so I don't have to draw all of the lines anymore!!! I can just use the laser--such a time saver!!! What? I didn't even know they made something like that! That is awesome! What kind of machine is that??? Kim - a laser machine! WOW! I've been marking all my HST on and off the last few days. Melissa, on "feb 4" on your timeline, it says building blocks..."at least two". What are the building blocks, and what does "at least 2" refer to? I believe it means to BUILD the blocks - as in putting all the pieces together to make a starburst block. Since the quilt is made up of 4 blocks, Melissa is asking that we make at least two of the blocks. Thanks Melissa, Fat Quarter Shop, and Mr.RandomNumber. 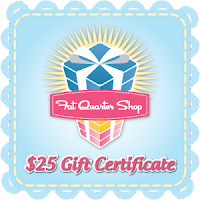 I am tickled pink to win the Salt Water charm pack. I love that fabric and it will be so much fun to get to use these...Thanks. Happy sewing everyone. Good Luck for next week. i had a problem with my download. it is number 8 that needs to be removed. i got number 9 to work. sorry. i am in slow class. My new machine is a Brother Dreamweaver. I got the one without the embroidery--since that was twice as much. I love it! It has the laser and several other things I just love. I sew right sides together all around the edges, then cut. No bias edges to deal with.